We are now announcing the winner of the ACTFL 2017 and lucky FB participants! Congratulations to Mrs. Jennifer Kuo, Ms. Clara Ye, Ms. Chumei Peng, Mrs. Amy Miller and Ms. Cassandra Tsai! Mrs. Jennifer Kuo and Ms. Clara Ye each won the 1 year subscription of Ponddy Chinese Smart Textbook for a teacher account and up to 20 students accounts! 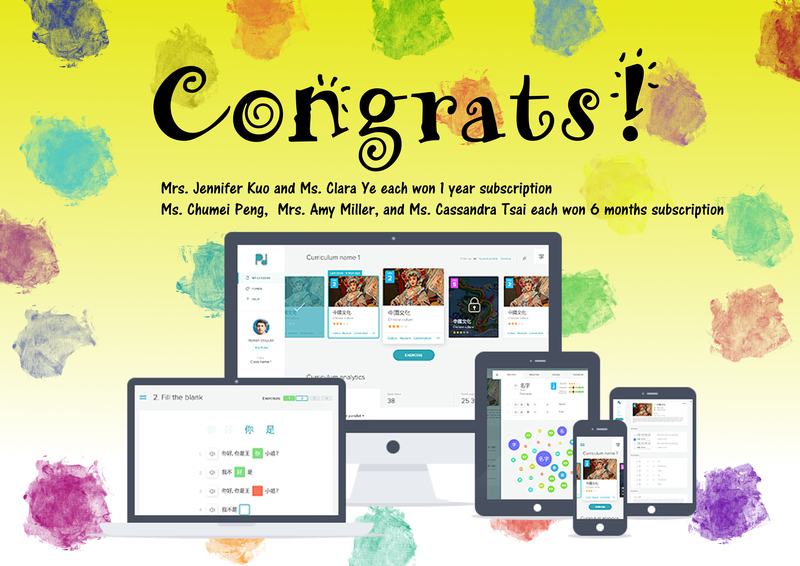 Ms. Chumei Peng, Mrs. Amy Miller and Ms. Cassandra Tsai each won a 6-months subscription for a teacher and up to 20 students to access Ponddy Chinese Smart Textbooks! Please check your mail to redeem your subscription.